3. My studded design on green from when I reviewed some products from KKCenterHk. I ended up loving these teeny studs, and especially the studded heart! 2. My Twinsie Tuesday textured fishtail braid. I love textured polishes, and I love fishtail braid manis, so it was next to impossible for me to not like this one! 1. My lily nails. I amazed myself that I could even paint lilies, and I loved how they all turned out! Since I joined Twinsie Tuesday this month, I wanted to share three manis from fellow Twinsies that were to-die-for in June! 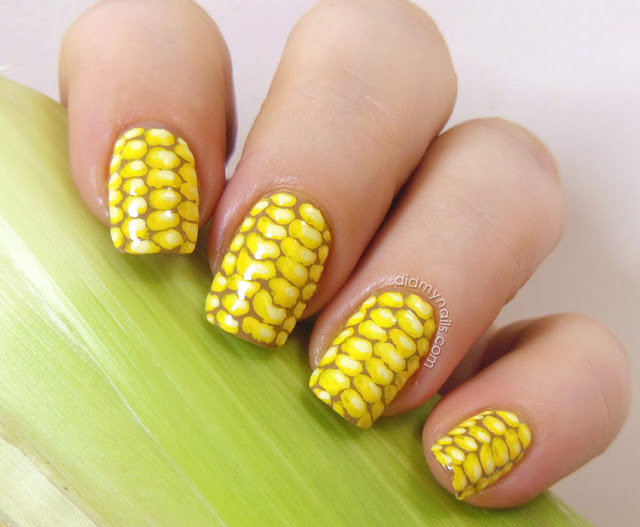 Elizabeth's corn mani from one of the TT challenges. Amanda's textured gradient nails from a TT challenge. I'm pretty jealous, because I cannot seem to get down the textured gradient! And Nory's gorgeous neon swirl mani that glows in the dark! Just a side note: I am going to my mom's for about a week, so since I get comment notifications on my phone, I'll be able to reply, but it may be about a week and a half or so before I can catch up on commenting on everyone's posts; but I do have some posts scheduled for the next week here!